The first of a small army of mini robots has started work at a bank in Taiwan. The robots – called Pepper – are not intended to replace human staff but to work alongside them. They will interact with and entertain customers as they queue up but also have a sales role providing information about financial products. First Commercial Bank plans to roll out 20 Peppers in Taiwan. Cathay Life Insurance will use 10 of the robots. A total of 100 rented Pepper units are due to “work” at other banks as well as in French retailer Carrefour’s shops in Taiwan. 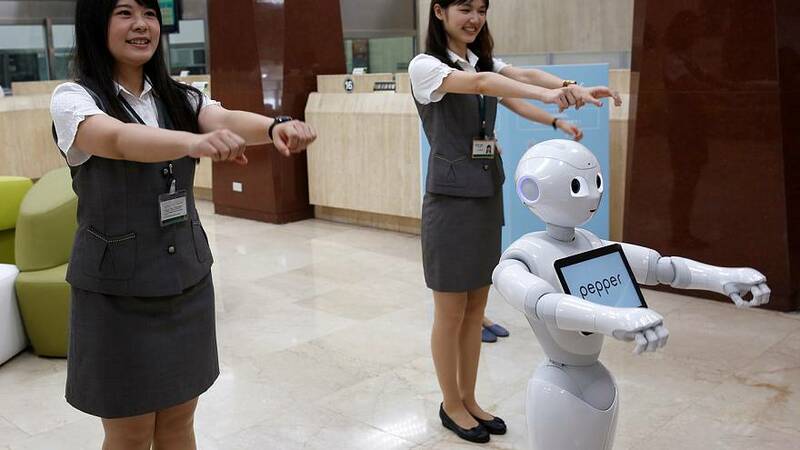 Taiwan is one of the first countries outside Japan to deploy the robots which are being used as a waiters, sales assistants and customer service representatives in about 500 Japanese companies. They are made by SoftBank which is promoting them as central to its vision of the internet of things, a network of devices, vehicles and building sensors that collect and exchange data.